cakelava: Celebrating the Big 3-0! 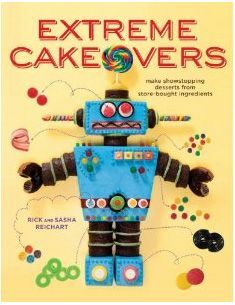 We often notice that our cake orders follow certain trends, and last weekend we had three brightly colored, wonky, and slightly over-the-top cakes to make. We posted one of the three cakes on our Facebook page, a crazy Dr. Seuss themed birthday cake, which you may have seen. The next night we delivered this 30th Birthday cake to Mercedes, who was having a pajama party that was just for the girls. Mercedes gave Rick free reign to design her special birthday cake. 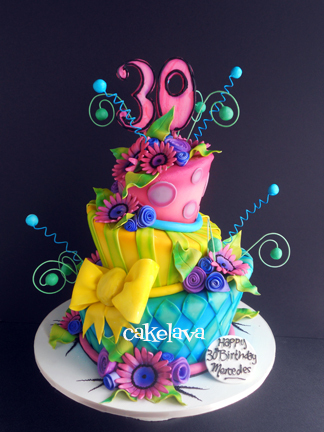 She wanted something fun, brightly colored and topsy turvy, and requested for any or all of her favorite colors to be included in the cake: Magenta, teal, blue, green, yellow, purple and dark pink. We knew she desired patterns on the cake and plenty of color. Rick didn't know what he was going to do until shortly before he was working on the cake, but decided to use all of her requested colors! Mercedes and her guests practically squealed when they saw the cake. It made our night to see her so happy and everyone appreciating all the hard work put into the cake. Happy Birthday to Mercedes! Beautiful. I love the color. Congratulations. 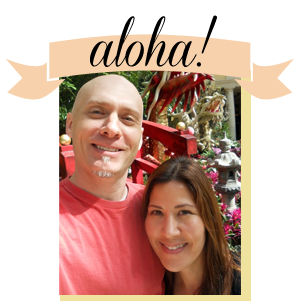 Thank you, both for the invitation and sharing with us your blog. All our Best! Love all of your work! Inspiring!!! I love bright colors on cakes. This one would be perfect for me. Thanks, Kathia! It was a really fun cake to make! Thank you so very much, Ana! It's an amazing cake and the airbrushing and color is just WOW!! !